Have you ever wondered what King David's last words were? Most people know about David and Goliath, have read the story and know that Goliath was a beastly man that stood very tall and that David was a small boy who had little hope of defeating Goliath. However, when push finally came to shove, David ended up defeating Goliath with the only weapon he had - a slingshot. King David's last words are very important. Many people throughout different religions looked up to David. They believed he was a great king who did many great things. King David's last words are inspiring and they give hope. His last words can only be found in the Book of Samuel. According to the Hebrew Bible, David was the second king of the United Kingdom of Israel. Throughout history and during his reign as King, he was said to be a righteous king who cared for his people. He was not just a king though. It was because of King David that the Bible holds the beautiful work that is known as Psalms. He was a musician and poet as well as a warrior. King David lived between the years of 1040-970 B.C. He reigned as King over Judah from 1010-1003 B.C. and then continued as King of the United Kingdom of Israel. Legend tells that the son of a David would be known as the Mashiach, or better known as the Messiah. A Messiah was described as a priest or a king who was traditionally anointed with holy anointing oil. Throughout the religion of Christianity, David was known as Jesus' adoptive father, Joseph's ancestor. In Islam, David was considered not only a prophet but the king of the nation as well. He was the only son of a man named Jesse who had seven other sons. He was a direct descendant of Ruth the Moabite. The only information that can be found about King David and what he did and accomplished throughout his life can be found in the books of 1 Chronicles, 1 Samuel and 1 Kings. He not only united the people of Israel but he also fought for them in battle and led them to victory. He built the foundation on which his son Solomon would later build a holy temple. Though King David's life was not so full of victory in the beginning, he never backed down in times of triumph. As a kid, David was Sheppard in Bethlehem. One day when he was herding, the prophet Samuel came to him and anointed him, without the knowledge of the present king, Saul. At the time, King Saul was looking for someone to play music for him at the time and through David's life, he was known to play music. 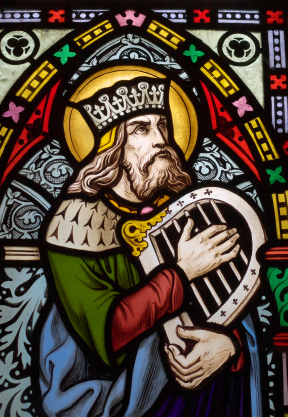 King Saul eventually kept David in his service simply to play music for him. It was not until his battle with Goliath that David showed his true courage and what he was meant to do on this earth. Once David has defeated Goliath, King Saul had found a new warrior for his team. With any great warrior, however, there comes the risk of jealousy, and that's what came over Saul when it began his attempt to kill David. Even though he did want David dead, Saul offered his daughter up for marriage to David. Saul's son, Jonathan had built a friendship with David but was ordered to kill him by his father. Jonathan did not want to kill his friend so instead he hid him until he could reason with his father. However, because Saul wanted David dead, he attempted to kill him again. This time David was able to find the help needed to break free of Saul's hold on him and run away to the prophet Samuel. David went on in life to do many great things; he became king and even married Bathsheba. King David passed his throne to Bathsheba's son, Solomon. He died of old age after having reigned as king over Hebron for seven years and Jerusalem for thirty-three years. "King David\'s Last Words." YourDictionary, n.d. Web. 20 April 2019. <https://quotes.yourdictionary.com/articles/king-david-s-last-words.html>.